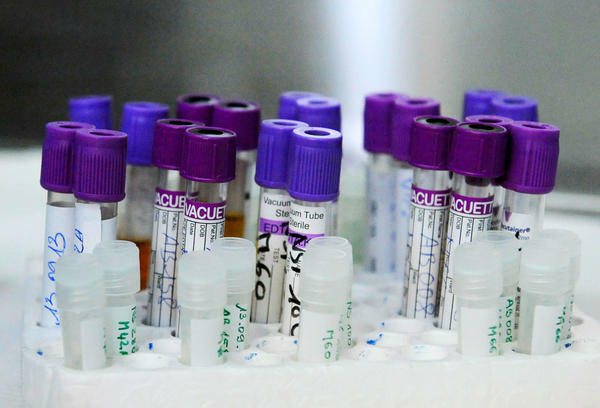 Blood samples of people living with HIV in a laboratory at the AIDS Research Center in Abidjan, Ivory Coast. Viral load testing is vital in monitoring HIV patients who are on lifelong anti-retroviral (ARV) drug therapy. Currently, most viral load testing in low- and middle-income countries is done in public laboratories on equipment owned, operated and maintained by the government. Under this new deal, a private diagnostic company called Hologic instead will provide all the equipment and supplies needed to run these tests and get paid for each sample that's analyzed. The hope is that this model will make viral load testing far more common in countries with some of the highest HIV rates in the world. Michael Anderson with MedAccess in the U.K., one of the partners in the Clinton Health Access Initiative deal, says increasing access to sophisticated HIV testing is a critical step if the world is ever going to see the end of AIDS. "Without viral load testing we will not be able to manage this epidemic," says Anderson. Viral load testing is considered by the World Health Organization as the gold standard in measuring whether ARV therapy is working effectively for an individual patient. "At the moment, fewer than 50 percent of Africans on (HIV) treatment have access to viral load testing," Anderson says. "Viral load testing needs to be escalated enormously if we're going to have any chance of tackling this epidemic." The U.N. has an incredibly ambitious goal of not just tackling this epidemic but stopping HIV transmission entirely by the year 2030. The plan relies on three main steps. The first is to get most people tested. The second is to get people who are HIV-positive onto ARV treatment. The third is to drive down the viral loads of the people on treatment to the point where they're unlikely to spread the virus to anyone else. This will involve getting tens of millions of people on ARV drugs for the rest of their lives. In some African countries, this means putting nearly a quarter of the entire adult population on treatment. Viral load testing is of the most accurate ways to measure if a patient is responding to anti-AIDS drugs. The test checks how much HIV is in a person's system. The more virus, the sicker the patient tends to be. If the level of virus is dropping or extremely low, it's a sign that the drugs are working. The World Health Organization recommends a viral load test at least once a year for patients on ARV therapy. But this can be easier said than done. Such testing requires sophisticated laboratory equipment. It can be expensive. And far too often, according to Nqobile Ndlovu, the acting head of the African Society for Laboratory Medicine, it's not available in Africa. Reached by phone in the Zimbabwean capital Harare, Ndlovu says many countries have equipment to test for viral load, but the machines aren't working. "If you move across most of the African continent, we have got machines lying idle, lots of machines lying idle, because we can't maintain them," he says. Ndlovu says these machines are expensive to run and even more expensive to fix if they break down. The viral load machines being used by Hologic have the added benefit of also being able to test for hepatitis B and C as well as HPV, the human papilloma virus. Ndlovu says the deal will initially focus on five sub-Saharan African countries. Catherine Barker Cantelmo, who studies health system costs with Palladium, a private global consulting company, says this agreement is offering viral load testing at a fraction of what most health ministries are currently paying. "We've seen prices as high as $50 or $60 per test," she says. But Cantelmo adds that price isn't the only reason why viral load testing hasn't been scaled up in many low-income countries. "In the past, it was easy to point to cost as being the problem," she says. "But even if the prices get to $12 per patient sample, you still need a lot of investment in the laboratory infrastructure, which is a huge cost." And she adds that monitoring an HIV patient is about more than just a test. Someone has to draw the blood, then the sample has to be transported to the lab. Someone has to analyze the tests and adjust the patient's drug regimen if there are problems. But with nearly 40 million people living with HIV around the world, getting regular viral load tests for them is going to be a crucial step in managing their individual care and the global pandemic.